The above ingredients list of Thomas's Light Multi-Grain English Muffins, which I bought yesterday, bolds the words "wheat" and "milk." I guess it's supposed to trick our eyes from seeing the rest of the list, which is mostly made of four-syllable words with lots of X's in them. 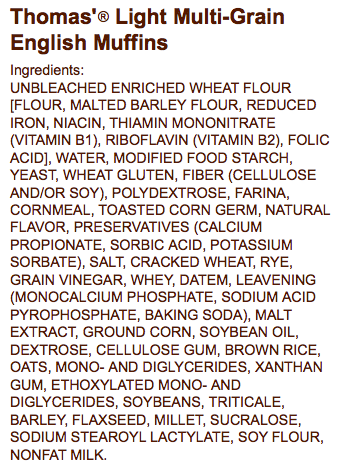 Do I really want to buy bread that has all this stuff in it? No, but I bought the bread on a whim to have an easy breakfast option since I have been lazy about coming up breakfasts this week. I often look at the ingredients on stuff I buy, so I'm not sure why I didn't look at this one. It's probably because English Muffins have a halo around them. They're the "healthy," low-carby breakfast bread option. I have no idea what ethoxylated diglycerides, triticale or sodium stearoyl lactylate is, or if these things are even really bad for you. I get that bread companies have to deal with shelf life, but I know that I don't want to be eating this stuff. 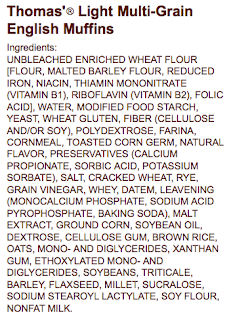 Being a mom definitely makes me think a lot more about what goes into our bodies We don't eat a lot of packaged food, but seeing this ingredients list made me think that I want to eliminate even more of it from our diets. Inspired to know what I'm eating, I made a couple of batches of bagels, the dough for the no knead bread recipe and pizza dough today. It's definitely work to make your own breads, but I think it's satisfying on several levels. What I try to do is make a bunch of stuff all at once, so if I have the food processor out, I'm not just making one thing. I can freeze the bagels we don't eat immediately, the pizza dough can be refrigerated for 3 days before using it and I can freeze the no-knead bread, too. I couldn't do this if I was working, but I'm not, so I make the time to do it. I should post this ingredients list on my fridge just to remind me to look at ingredients when I shop. Bread should be a simple thing, not a chemistry experiment!